Faithful to its pioneering spirit, Mumm reinvents its iconic bottle through an avant-garde design. The Mumm Grand Cordon bottle thus enhances the Pinot Noir, the House's emblematic grape variety. Creation of a sober packaging in the codes of luxury, the red ribbon embedded in the bottle of the Grand Cordon vintage can be seen through a window dug on the front of the closed box. 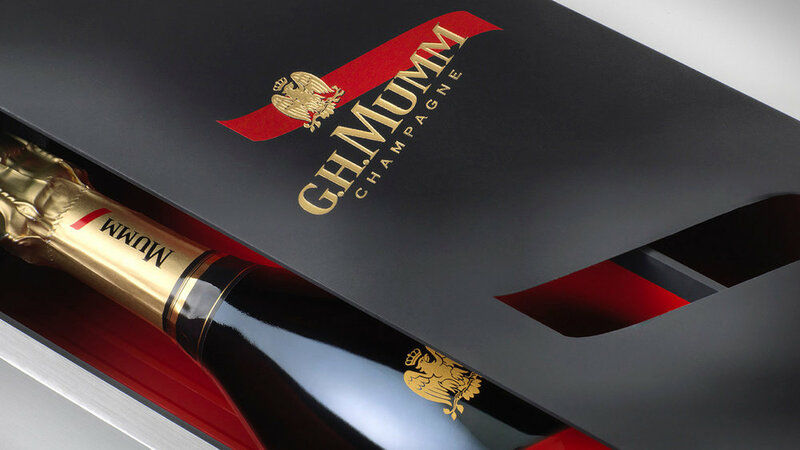 It opens like a drawer to reveal, on a red background, the emblematic champagne of the Mumm House, which remains attached to the motto of its founder George Hermann Mumm: "Only the best". Printing on soft touch matt black paper, embossing, hot foil stamping, selective varnishes. Inside the red packaging on gold polyester paper to give depth to the red. Excellence Rhum, a family company, honors the authenticity of rums from all over the world and the expertise of traditional distilleries. For the creation of its "COLLECTION" range, we have established a brand identity and a graphic universe for the 4 first aged rum cuvees with strong tasting notes. Our concept, based on strong elements from the 4 Caribbean islands, illustrates the history and the identity of rum varieties. The selection of typical elements from each local culture has enabled us to represent each cuvee with an animal as an ambassador and a symbol of each island. The use of vivid colors in delicate engraving illustrations gives to the range a real authenticity with a touch of modernity. The colors have been selected so as to highlight the different color and origin of each rum. SAINT JAMES agricole rums, famous all over the world for their exceptional quality, are the fruit of a long history of passion, know-how and expertise which started in 1765. Elaborated from fresh pure sugarcane juice, SAINT JAMES rums have been accredited the Martinique A.O.C. ( Appellation d’Origine Contrôlée/Controlled Designation of Origin) which ensures their quality and their intimate link with the planting terroir. Our mission was to create a packaging common to the three different SAINT JAMES references. The packaging size was adapted to the Long Island 70 cl. 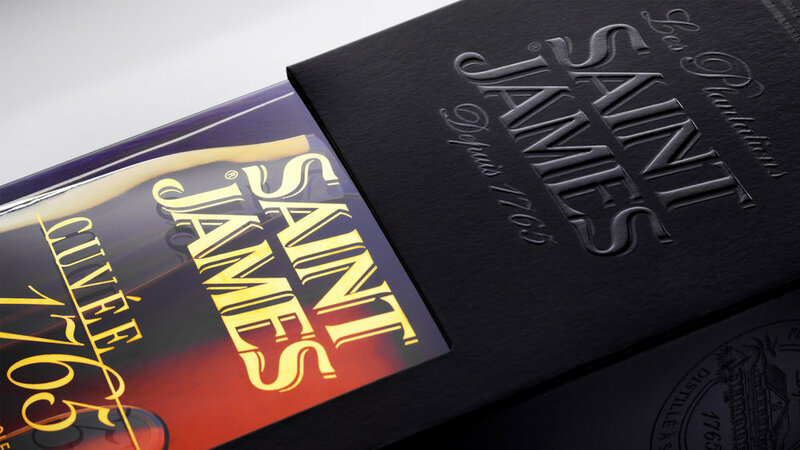 This packaging had to value the SAINT JAMES brand and to drive purchase intent across the various distribution networks: GMS, Wine merchants, Export (Duty-free). We created a sober packaging following the codes of the luxury sector, with a window in the box which lets the front label of the brand readable. The graphics are consistent with the packaging of the 3 decanters so as to create a range effect. The window was designed shifted and overflowing on the side of the packaging to give an identity to the packaging and emphasize the shape of the bottle. A "Neutral" marking in a way that it is adaptable on the 3 references. - printing on matt black paper: embossing, hot gilt, selective varnish. The inner packaging was lined with gold to sublimate the color of rum drinks. Aikan is a whisky distilled and matured in France and in Scotland, which then crosses the ocean to arrive up to the Caribbean sea. It is on the Martinique island that the distillation is pursued, nearby a water source flowing from the Pelée mountain. There, the whisky ages in oak barrels in JM’s rum distillery wineries. Aikan means « wedding » in Arawak, which was the language of the first Amerindian in Martinique. We chose that mixing would be the key element to create the visual identity of the brand, which will be applied to all of its communication medium. Aikan’s identity is the result of two climates and also two different times, finding its inspiration in the Amerindian era, the first ones to arrive in Martinique. We put forward the union between these different universes, which intertwine through an illustration simultaneously ancient, contemporary and representative of the cultural union between Europe and Martinique. The logo, which represents an Amerindian hairstyle with feathers, also incorporates a lily flower, an explicit reference to the union of these cultures. We also added a reinforced and hidden message at the back of the facing: the representation of the union between a European woman of that time and an Amerindian man. This is the symbol of the authentic union of two cultures (printing of a double-sided adhesive label). Roche Mazet, a brand part of the Castel Frères group, is a family-run company which produces wines from the pays d’Oc and shares its passion for the French soil since 1998. For the summer of 2017, we created an innovative box to magnify its bag-in-box range with a precise meaning and function, while remaining in line with its values: a wine of quality and accessible to the greatest. We chose to go beyond its practical aspect and brought an added value to underline its difference and to create a shared enjoyment with the accessory. We created an innovative box, which will be used for its 7 references: 2 reds, 2 whites and 3 rosés. After studying everything that could have been done in this sector, we worked on several essential criterias: making it unique as well as practical, aesthetic and playful, matching with a wide audience in various situations. Aesthetic by the object’s purity and simplicity, which can be placed on any table, from a chic buffet to a summer picnic. Practical thanks to its carrying handle and its elevation, facilitating the service to the glasses without tilting neither the BIB nor the accessory. Playful by its pivoting function, which creates an effect of surprise during moments of sharing, while facilitating the insertion of the BIB and the access to the tap: an accessory that remains faithful to the spirit of the brand. This whisky was born from the marriage of an audacious Japanese man and his Scottish muse. The project goal was to seduce a wider, European public. Half-way between tradition and innovation, our design concept is based on origami. It perfectly illustrates the link between the two cultures and nourishes a new communication territory. Through paper folding, the choice of materials and customised decors, we gave personality to each product category, whilst creating a coherent brand image. An infinite variety can be expressed through any media form. Drawing its inspiration from himitsu-bako (boxes carried by Samurais that contained secrets) and origami, the Nikka Box introduces the brand’s six emblematic whiskies in a variety of ways. An innovative set which can be turned into a mini bar to display at home. We redesign the box for each new edition. When designing the box for this Japanese whisky which has an alcohol content of 51.4% and is a best-seller in France, we went for a modern and masculine look in harmony with the bottle/vial. The box itself is similar to the Nikka Box, with its discreet facing that delivers a surprising effect. When opened, part of the packaging pivots to reveal the bottle, pouring spout and glasses. Pure Malt Spice Rack Trilogy is a real tribute to these 3 whiskies, assemblies of Yoichi and Miyagikyo single malts. This collector trilogy is the last opportunity to taste the most peated whiskies of Nikka’s range. The Box offers 3 Pure Malts in a wooden spice rack, made specially for the typical shape of these bottles, reminding us of the spice racks we can find in kitchens, with 3 spoon pods which are very practical to not mix the whiskies together while tasting them. Once they are emptied, the bottles can be useful for keeping all sorts of ingredients, like olive oils, exotic spices or even homemade syrups. The challenge is to find a way to differentiate the three products with a surprising effect for each new edition. While the packaging remains the same, each whisky has a specific Japanese pattern that customises its appearance. The box features a different cover for each product to create differentiation. The pattern can be seen via a window on the facing. Design of a wooden serving board that fits seamlessly into the box door, with a rounded end to make it easier to hold. Offering a bottle becomes an art with this packaging design, faithful to the product's identity, a mix of discovery and origami. Taketsuru, a combination of the Miyagikyo & Yoichi folds, since it is a blend of these two whiskies. A subtle graphic design for the most effeminate and fruity Nikka whisky. An “old school” imposing box that matches the design of this 12 years old whisky bottle. Our aim was to create a visual identity and packaging that expressed both the values of a great champagne house and the intrinsic qualities of an exceptional wine. That is why we have set up a relationship between the container (packaging design) and the content (the wine) to build our creative concept. No. 8 was selected to reflect the rarity, excellence and precision that typify this special vintage. The sensuous curves of the packaging, the bottle and the label all emphasise refinement, elegance and femininity, which are the signatures of the cellar master Caroline Latrive. The light, ethereal and festive characteristics of the Art Deco patterns are a nod to the 1920s, the golden age of Ayala. The fresh colours and voluptuously curved geometric shapes have been selected to create brand codes that are easily recognizable and applicable to all publicity material. The chalk colour and textured paper are evocative of the limestone of the precious terroir and its features. - Traditional ancestral know-how, which is specific to great champagnes. Classical patterns in a Second Empire style have been livened up by bright colours that reflect the modernity of the packaging innovation: a case that turns into a champagne bucket and that can hold chilled water for several hours. Thanks to thermochromic ink, the VIRGINIE T. marking at the back of the bottle changes from white to red when the ideal serving temperature of 8°C is reached. Drawing on the famous Taipei 101 tower in Taiwan, the Kavalan bottle has an original shape that stands out immediately. That reference to local architecture was the starting point of our packaging research. Taiwan combines technical efficiency and innovation with traditional Chinese curved roofs, bright colours and nested lines. Keeping this blend of tradition and modernity in mind, we have decided to work on simple shapes that refer to the contours of contemporary monuments, to which we have added subtlety that will become the signature of the brand. The edge at the top of our boxes is curved, in a nod to the dynamic of oriental roofs, associated with the cultural symbol of elegance and vitality. Like the fronts of both old and modern buildings, particularly that of the Kavalan distillery, we gave our packs a geometrical finish. Clean lines that work with each other, colours of natural elements and rhythmic curves create a range effect while giving each product its own identity through effects and finishes. Concept around a graphics composition with an illustration design typical of the 18th century, to restate the historic roots of the brand and its pillars and to create a range effect by making the products stand apart (terroirs). Château du Seuil en Provence is a 55 hectares vineyard located on the sunny slopes in the center of the appellation Coteau d'air in Provence. Great wines from Provence rosés but also white and red ones. A concept around a view of the garden from the sky to create a brand code distinguishing itself from its main competitors in the region. Declination of this new identity on any communication medium, starting with the design of the whole wine range. Manufacturing recommendation. Choice of an identity bottle standard. Work on the label shape. Textured and gilded paper with brand code. Creation of a crest for the brand, expressing the terroir, the climate and the historic roots of the House. A concept that breaks the classic colour codes of the sector to bring legibility to the complex universe of Bordeaux wines. Creating monograms on embossed paper to elegantly bring to mind the 12 Côtes de Nuits and Beaune appellations and to create cohesiveness across the product range. Creating hybrid characters which combine two emblematic Gascony figures, the duck and the musketeer, so as to provide each item with distinction while maintaining the cohesiveness of the product range. Label and box design for the special night-time grape harvest of the 27 September 2008, which produced this vintage named "Songes d’une Nuit de Vendanges". Carafe label design for “Extra-Extra” cognac, playing on transparency and a sanding technique. Creation of a luxury pack design. Creation of a graphic identity for the re-launch of this premium brand of environmentally responsible organic wine targeted at the major retail market. Our aim was to embody the diversity of French viticulture. Each harvest carries the personal signature of its vigneron and identifies the specific terroir where it was picked.